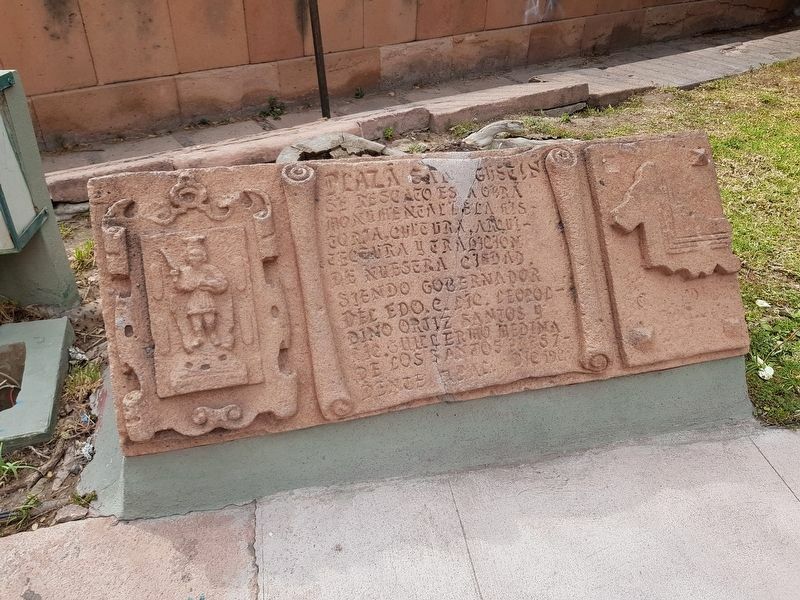 En 1603 los agustinos obtienen los permisos para fundar su iglesia, atendiendo a los indios tarascos. En 1655 construyen la torre oriente, entre 1710-1712 la sacristía, en la portada lateral y después, la torre poniente. 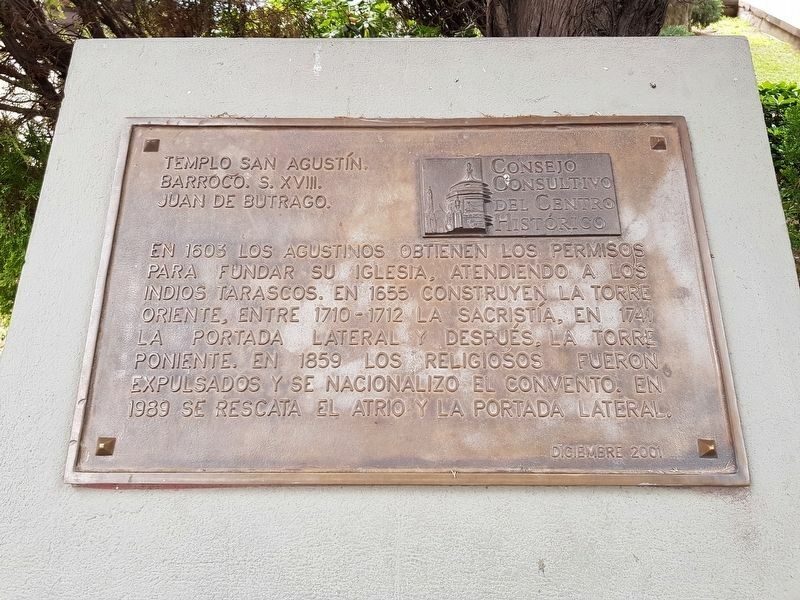 En 1859 los religiosos fueron expulsados y se nacionalizó el convento. En 1939 se rescata el atrio y la portada lateral. In 1603 the Augustinians obtained the permits to found their church, attending to the Tarascan Indians. In 1655 they built the eastern tower and between 1710-1712 the sacristy near the side entryway. Later the western tower was built. In 1859 the religious members were expelled and the convent was nationalized. In 1939, the atrium and the lateral portal were recovered. 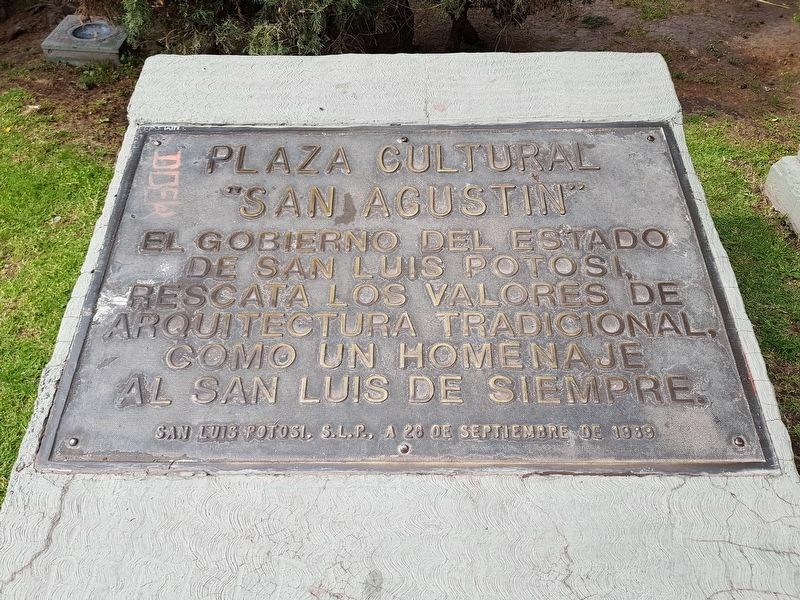 El gobierno del estado de San Luis Potosi, rescata los valores de arquitectura tradicional, como un homenaje al San Luis de siempre. N, 100° 58.458′ W. Marker is in San Luis Potosí, San Luis Potosí, in Municipality of San Luis Potosí. 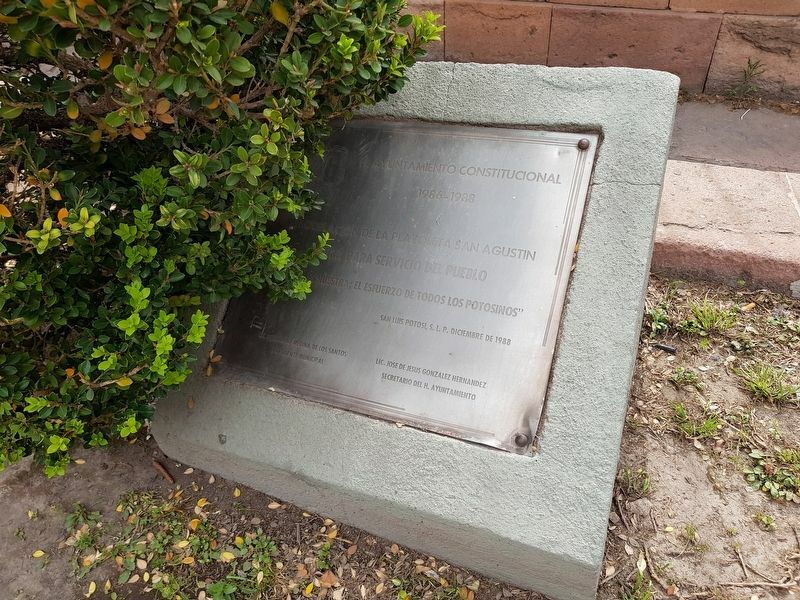 Marker can be reached from Avenida Universidad just east of José María Morelos y Pavón, on the right when traveling east. Touch for map. Marker is in this post office area: San Luis Potosí 78000, Mexico. Touch for directions. Other nearby markers. At least 8 other markers are within walking distance of this marker. Temple and Ex-Convent of San Agustín (within shouting distance of this marker); San Agustin Temple (within shouting distance of this marker); Museum of Masks (about 120 meters away, measured in a direct line); Teatro de la Paz (about 150 meters away); Viceregal Art Museum (about 180 meters away); Temple of Carmen and Ex-Convent of the Barefoot Carmelite Religious Order (about 180 meters away); Al Libro Mayor (about 210 meters away); Española Bookstore (about 210 meters away). Touch for a list and map of all markers in San Luis Potosí. The featured marker can be seen here to the right in front of the temple. The additional markers are further to the right in a small parking area. More. Search the internet for San Agustín Temple. Credits. This page was last revised on April 15, 2019. 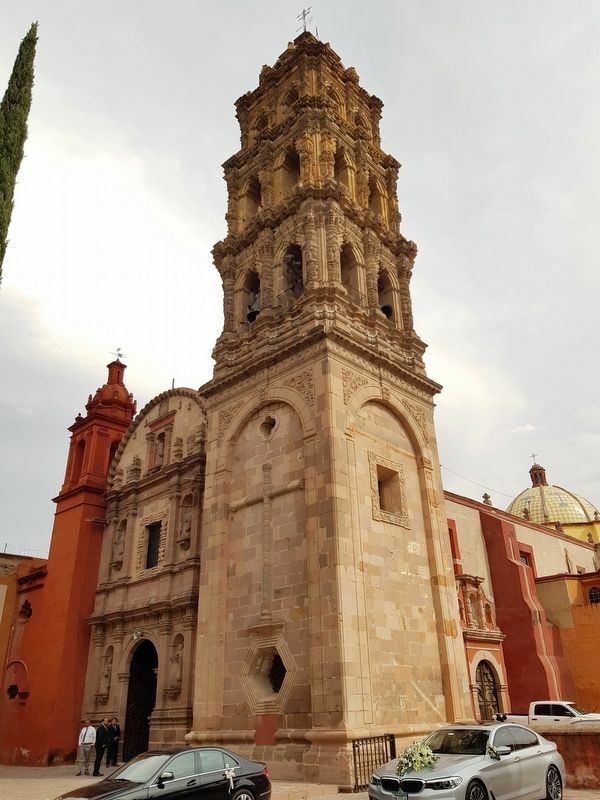 This page originally submitted on April 15, 2019, by J. Makali Bruton of Querétaro, Mexico. This page has been viewed 30 times since then. 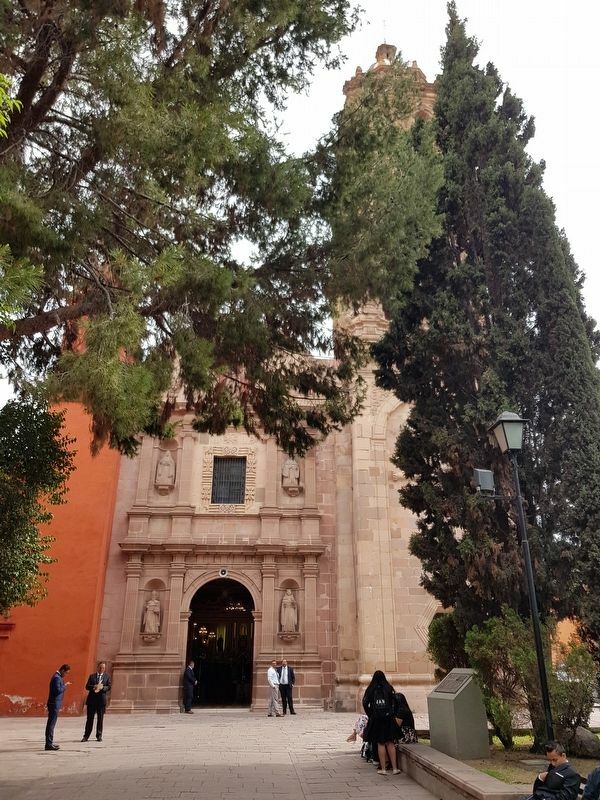 Photos: 1, 2, 3, 4, 5, 6. submitted on April 15, 2019, by J. Makali Bruton of Querétaro, Mexico.